The pregnancy blood test measures the quantitative level of beta hCG which can help identify a pregnancy earlier than urine testing. What is a pregnancy blood test? This pregnancy blood test measures the hCG blood level. Why would I get a pregnancy blood test? The blood pregnancy test is more accurate than a urine pregnancy test and can detect pregnancy at an earlier stage. What will my pregnancy blood test results look like? The results of the blood pregnancy test will come back as a number. A determination of the pregnancy status can typically be made in relation to the reference range associated with the number. This Pregnancy Blood Test is a blood test. The pregnancy blood test, also known as a quantitative hCG test, hCG lab test, hCG blood test, blood pregnancy test and pregnancy lab test, checks for pregnancy in the blood through measuring quantitative beta hCG levels. hCG, or human chorionic gonadotropin, is a hormone that can be measured in the blood. hCG blood levels are routinely used to check for the presence of pregnancy in fertile women and to assess the stage of the pregnancy. hCG is sometimes described as being similar to the pituitary hormone luteinizing hormone in its functions. hCG plays an important role in fertility and, as a result, is produced early on to support a new pregnancy. When a fertilized egg manages to implant into the lining of a woman's uterus, the egg forms an organ called a placenta that connects the uterus to the new fetus. As part of its role, the placenta will produce hCG hormone. In this capacity, hCG hormone helps maintain adequate progesterone levels in the pregnant mother which is why the progesterone test is frequently done with the blood pregnancy test. Getting a pregnancy blood test near you at a Quest Diagnostics lab is a relatively straightforward process. Once you place your pregnancy test order online, you will get your blood drawn at the selected lab. 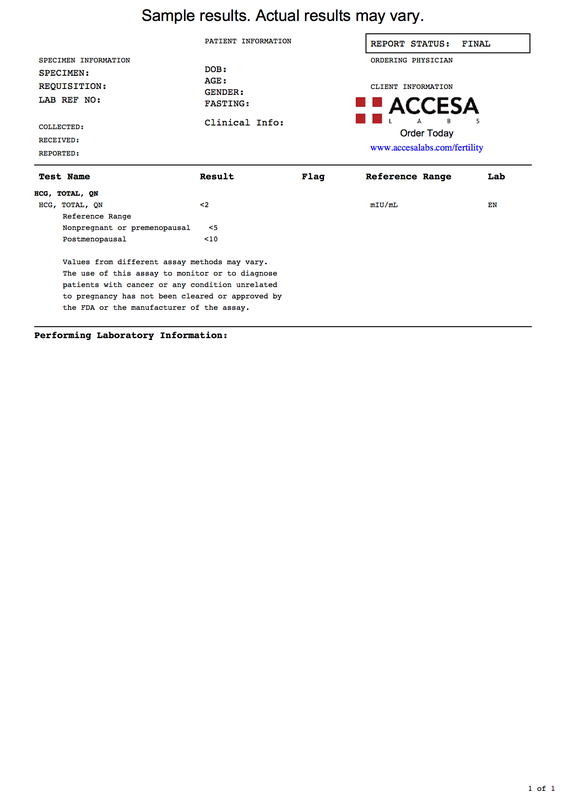 Quantitative beta hCG lab test results are processed relatively quickly and an electronic notification will be sent once the pregnancy lab test report is available for download. Is fasting required for the pregnancy blood test? For simple blood pregnancy testing, there is no need to fast before a blood pregnancy test. However, if one is getting other tests that require fasting at the same time, then an 8-12 hour fast prior to getting this pregnancy test should be performed. This blood pregnancy test is considered a quantitative test as opposed to a qualitative one. Said another way, pregnancy blood test results from this particular test will report as a numerical hCG level result as opposed to just providing a simple positive / negative answer as to whether one is pregnant or not. Once one has the hCG blood level number, that number can be compared against the lab's recommended reference range (in mIU/mL) to help interpret the result. On the sample pregnancy test results provided above, for example, the level is <2 which, when compared to the Reference Range, falls into the <5 category which implies nonpregnant or premenopausal. If the total hCG blood level had been >5, then the blood test result implies pregnancy assuming that the test was performed on a woman who is suspecting that she might be pregnant. Using the pregnancy test result in this way can help check for the presence and stage of pregnancy when it is appropriate to do so. While the blood level of hCG measured by this lab test can give a snapshot of one's pregnancy status at a point in time, it does not give any kind of assessment as to one's capacity to get pregnant. People interested in their potential fertility gravitate towards measuring their ovarian reserve through the AMH test and complementary fertility hormones such as the FSH test and LH test. Often, for women undergoing IVF, the blood pregnancy test is tracked alongside these other fertility tests on a monthly basis until a successful implantation occurs. Fortunately, every standard lab location that Accesa Labs works with can perform these types of fertility blood tests because they only require standard lab and specimen handling. The history of how the blood test for pregnancy came about is an interesting one. In the 1930s, the human chorionic gonadotropin hormone was discovered as a means to check for pregnancy. A specific portion of the hCG molecule - the beta subunit - was found and served as a useful fingerprint to identify the presence of hCG. A molecule consisting of 145 amino acids, this beta subunit resulted in this lab test sometimes being known as a beta hCG test. While a major advancement, the hCG test was still limited in its use early on because of the complexity of performing the test. Requiring special lab processing, this innovative test for early pregnancy was primarily utilized only in professional medical settings. In addition to being inconvenient because it required an appointment at the doctor's office, the processing requirements for the blood drawn from the potential mother resulted in a relatively long lag (by modern standards) in the reporting of the results. Additionally, because the test lacked sensitivity, particularly in the early stages of conception, some medical providers still preferred ultrasound as the method of choice to check for an early pregnancy. With technological advancement, the first home pregnancy test was introduced in the 1960s. With its development, a whole new population of women could test themselves at home. While not as accurate as blood pregnancy tests, particularly for recent conception, urine pregnancy testing using home test kits enabled women to test themselves conveniently and privately in their own homes. Despite the fact that the first home pregnancy tests took 2 hours to report results, they were a tremendous advancement. Today, in spite of the widespread adoption and use of the home pregnancy test, the blood pregnancy test continues to play an important role. One advantage of the blood pregnancy test is that it can usually detect the presence of hCG hormone earlier than the urine pregnancy test can. As a result, when compared to a blood test, home pregnancy tests may sometimes report a "false negative" result (a negative test when the woman is actually pregnancy) because the urine test was performed outside of the recommended testing window. Because the blood test is much more sensitive than the urine test, some women prefer the blood pregnancy test to find out if they are pregnant as early as possible. A highly accurate lab test, most research suggests that this hCG blood test can detect a pregnancy 7-12 days after conception. With that in mind, even a blood pregnancy test can be performed too early if one has their blood drawn before the recommended window after an actual conception. Some might consider the blood pregnancy test to be "wrong" in cases like this but it is more a case of the test having real limitations as to when it can detect hCG in the blood. Another reason some people prefer a blood pregnancy test over a urine one is out of concern that the home test gave inaccurate results because it was not performed accurately. The home pregnancy test requires multiple steps, including urinating on the appropriate part of the strip or kit, waiting the right amount of time, and then assessing the results in comparison to a control. In early pregnancy, a urine hCG test kit that uses a colored line to demonstrate a positive might show a result that, for example, is faint and somewhat difficult to interpret. The blood test can take away some of this uncertainty, particularly given the importance of accurate test results. At times, a women might need to get a blood pregnancy test is to have documentation of a positive or negative result. For example, if a woman is undergoing an elective surgery unrelated to pregnancy, she will often need to prove that she is not pregnant shortly before the procedure. As another example, a woman might need to show a pregnancy test result when applying for health or life insurance as part of the insurance application. Even though the urine hCG test might show the same results as the blood test, it would not be considered an acceptable lab test result in one of these situations. Rarely, the hCG levels in the blood are used to look for and/or track certain types of cancers. High levels of hCG hormone can be found in a class of tumors called gestational trophoblastic tumors that include molar pregnancies and choriocarcinomas. Men can also have elevated hCG blood levels if they have a specific type of tumor (typically originating from the testicles) from a class of tumors related to germ cells. In these cases, hCG blood assessments can play a vital role in both diagnosing the presence of a tumor and evaluating and tracking the response to treatment. Despite the valuable role that blood pregnancy testing plays in a wide range of situations, there is still room for advancement. Even though most test results come back fast (sometimes as soon as one day), there still can be improvement on the turnaround time of this important lab test. Also, to date, an accurate pregnancy blood test cannot be performed using a simple drop of blood to make a diagnosis. Nonetheless, the blood pregnancy test is an important part of diagnostic lab testing and will continue to be so in the years to come. Pregnancy Blood Test at Guaranteed Prices.